The summer before my Freshman year of High School, my family moved from Utah to Idaho. Imagine how thrilled I was to find that in Idaho, fourteen is the age a driver license can be issued. I took drivers training as a class that fall in school, passed the written and driving tests, and received my license. I will never forget an interchange between my mother and I one afternoon shortly thereafter. She needed something from the store for dinner, so I volunteered to take the car (my father’s Cadillac) to the store for her. She said she wasn’t comfortable with me taking that car out on my own just yet. In response, I said, “I passed the written and driving tests. The State of Idaho says that I’m just as good a driver as you are.” She then explained to me that just because I was “book smart” and had a bit of time behind the wheel, those things did not equal her many years of actual driving experience. All those years of driving developed her skills and enabled her to become a driver with the ability to make good decisions—sometimes quickly and under pressure. She had driven in many different weather and road conditions and had developed a sixth sense about unseen dangers ahead. She assured me that these would all come to me in time also, but for now my father’s car was off limits to me. My hands never did grip the steering wheel of that big Caddy. What just happened here? I see a large group of people, perhaps young adults, who are tired of hearing counsel and direction that interferes with the things they want to do or believe. They yell, “Go up, thou bald head” (or in today’s terms, “Get out of here old man!”) as they reject Elisha the prophet and his teachings. “Bald head” specifically points out that the fact that he is old; implying that he is out of touch, old fashioned, not with it, behind the times, or not hip. It also implies that the prophet Elisha cannot possibly relate to them or their views on the latest trends or issues. They may feel that the world has moved on and that Elisha’s ideas are outdated or no longer relevant. The crowd is young and enlightened. By the power vested in Elisha, he brings two ‘she bears’ out of the woods to ‘tare’ them. The scripture doesn’t say they were slain by the bear, but ‘tare’ implies that they were certainly injured. The best scripture study includes likening the people in this story to ourselves. Let’s do that now. There are some within the membership of the Church (as well as many outside of the Church) who cry these same things today. Their mantra is, “What can these old men [and I’ll add women] have to say to us today? They are so out of touch. Things have changed in the world and they aren’t keeping up.” And actually, one of those things is true. The divinely called leaders of our Church aren’t changing. They aren’t preaching the more progressive messages the world wants to hear to sooth their conscience, validate their behavior, or align with popular trends. The reason our Church leaders aren’t preaching these philosophies is not because they are old and stuck in the past. It is because it is not their message. It is the Lord’s message. When He wants something changed, He will let us know—and He will do it through prophets and apostles. 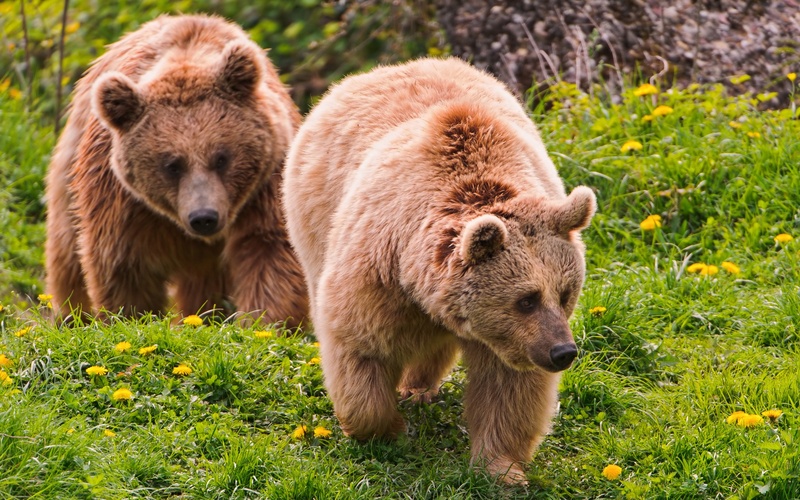 I feel pretty confident in saying that those who choose not to heed the counsel of Church leaders (and those who mock them), don’t need to fear that two ‘she bears’ will be brought out of the woods to physically harm them. But that doesn’t mean there aren’t spiritual consequences. There are. To this, I say thank goodness. We have all known those who have been called to positions in either local or General leadership that have been younger than usual. It is wonderful to see how the Lord magnifies them and to watch them grow to fill those mantles. I find great security in knowing that those serving in the highest positions of leadership are seasoned by years of experience. Their emotional and spiritual maturity enables them to stand strong with calm and resolution against the philosophies of the world. And I am safe from the figurative ‘she bears’ when I stand with them. Full head, gray head, bald head; it’s full steam ahead for The Church of Jesus Christ of Latter-Day Saints under the direction of the Lord’s chosen leadership. 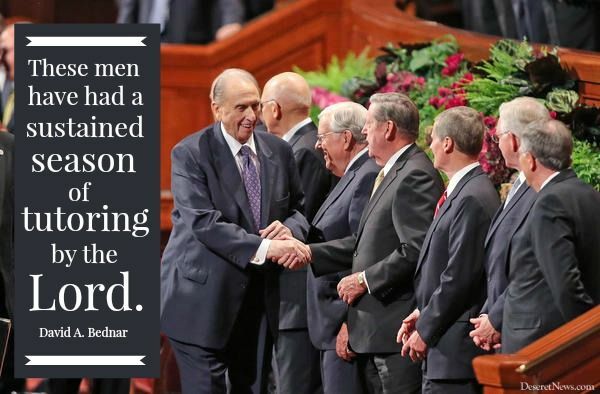 This entry was posted in Prophets and Apostles and tagged Apostles, Faith, obedience, prophets on October 26, 2015 by Bethany Packard. Wonderful article! Puts it all in perspective. The young people who disdain the older leadership just want to go their own way without being called to repentence. God has not changed, modern society has merely decided the “old immorality in a new dress ” (to prarphrase Pres. Kimball) is more attracitve to them.